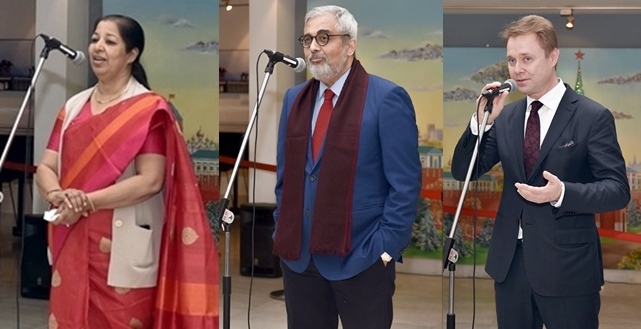 Definite prospects on new dimensions of continued strengthening of multilateral cultural cooperation between the peoples, particularly the youths, of BRICS nations was registered by distinguished speakers at a colourful function organised at the Russian Centre of Science and Culture (RCSC) in New Delhi on December 16, 2016. 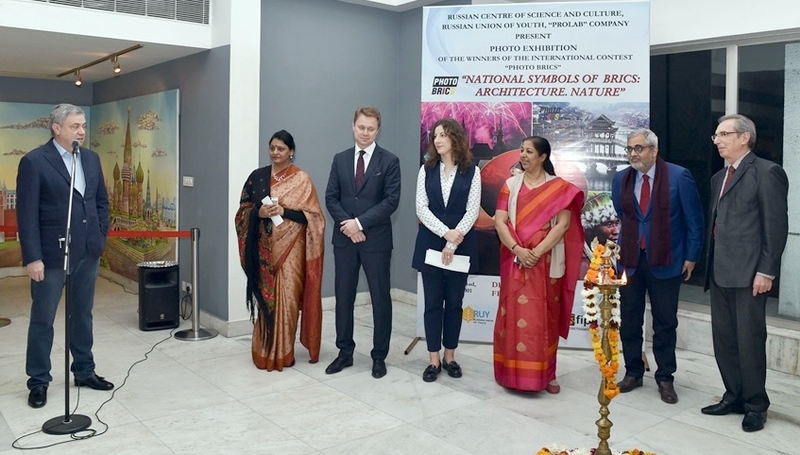 The occasion was the inauguration of the Photo Exhibition on the works of winners of the International Context “PHOTO BRICKS”– National Symbols of BRICS: Architecture, Nature, organised jointly with the Russian Union of Youth and “PROLAB” Company, Russia. 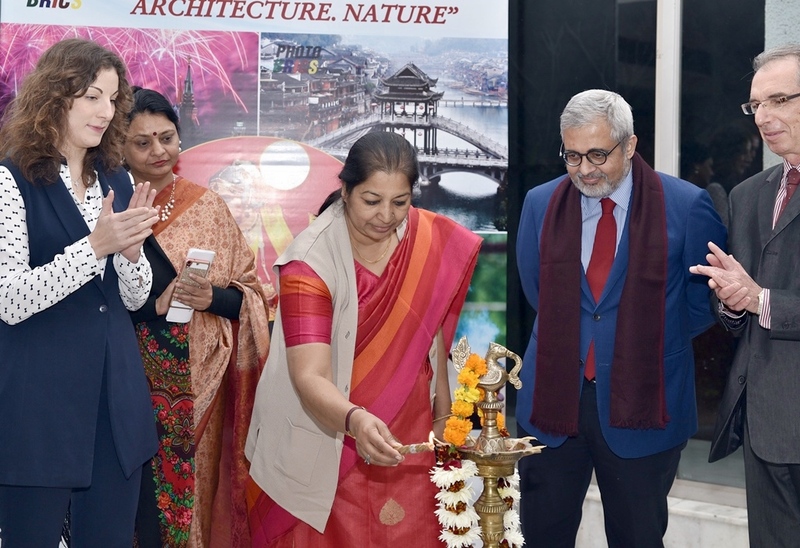 The dignitaries who participated in the event comprised Chief Guest Ms. Kiran Soni Gupta, I.A.S., Additional Secretary and Financial Advisor, Ministry of Youth & Sports & Ministry of Skill Development and Entrepreneurship, Government of India. Guest of Honour Mr. Nandan Unnikrishnan, Vice President & Senior Fellow, Observer Research Foundation, Mr. Sergey Karmalito, Senior Counsellor, Embassy of the Russian Federation in India, Mr. Fedor Rozovskiy, Director, RCSC, Ms. Tatiana Seliverstova, Deputy Chairman, All-Russian Public Organisation “Russian Union of Youth” Central Committee, Mr. Kanavin Nikolay, Chairman of the Board of the Holding, PROLAB, Ms. Purnima Anand, one of the founders of BRICS International Forum and Chairman, International Federation of Indo-Russian Youth Clubs, BRICS Youth International Forum, and others. Describing youths as the great promise of the country, Ms. Kiran Soni Gupta visualised ever-new vistas and dimensions in all spheres of life with the consistent dialogues, interaction and cooperation between youths of BRICS countries, which would go a long way in the overall prospects of humanity. 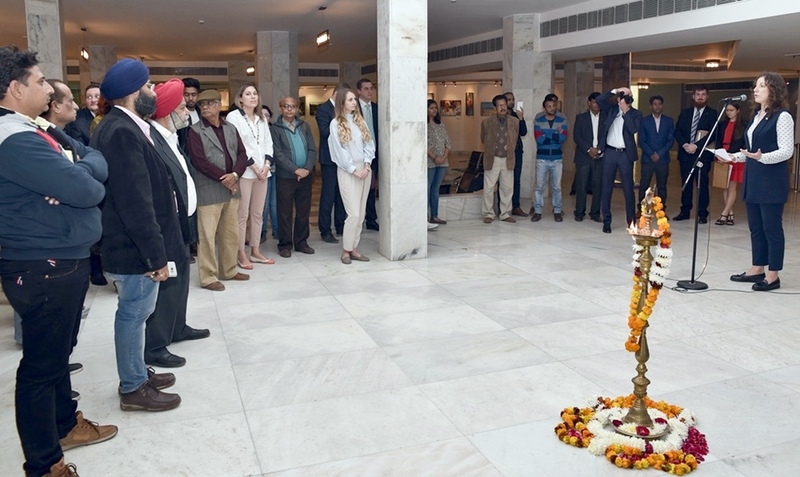 She referred to the commendable imagination and skill of youth having been expressed through their impressive paintings, and promised all possible support to promote the youth activities through organisation of events and exchange programmes. 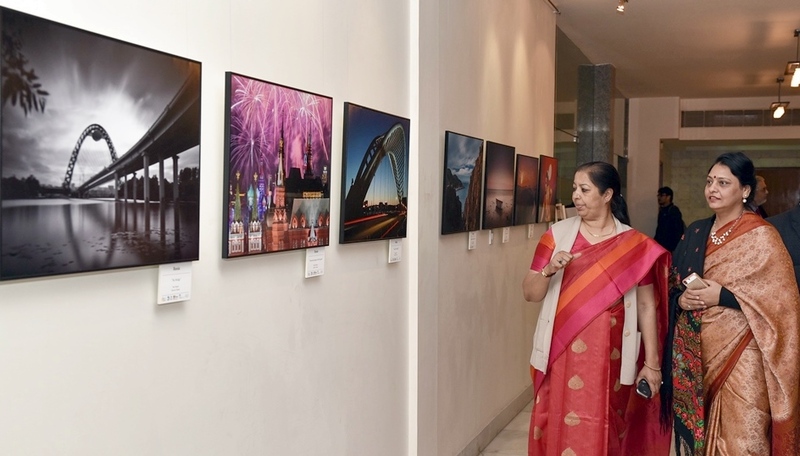 Ms. Kiran Soni Gupta hailed the appreciable organisation of photo exhibition by the RCSC. Reiterating the imprint left by youth through their artistic perception, Mr. Nandan Unnikrishnan expressed the hope that the youths of BRICS could by all means show enviable progress and make an exceptional mark as a role model in the developmental process of countries by virtue of their vast potential, hard work and will power. In an obvious note of deep appreciation, he hailed the organisation of such a remarkable photo exhibition of enormous significance imbibing inspiration and enthusiasm among the youths at large. He underscored the relevance of youth’s participation in bringing in a positive impact on the decisive objectives of institutions like BRICS and SCO (Shanghai Cooperation Organisation). 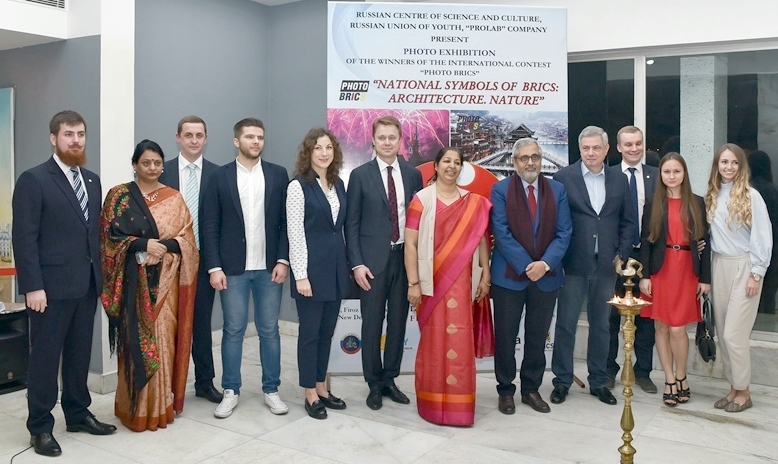 Mr. Fedor Rozovskiy made an emphasis on the bright future of multilateral cultural cooperation between BRICS nations, generally between the peoples and particularly between the youths. The event Photo BRICS will hopefully contribute a lot in this regard, he added. Ms. Tatiana Seliverstova was all praise on the unique dynamism of Indian youth, their initiative, attitude and perseverance, which went a long way in the successful organisation of events to the greater benefit and inspiration of the participants from BRICS countries. She looked forward to the ever-more added efforts in organising events and exchange programmes. Ms. Tatiana said that Photo BRICS will be an annual event and the next one will be in China, followed by Brazil and South Africa. 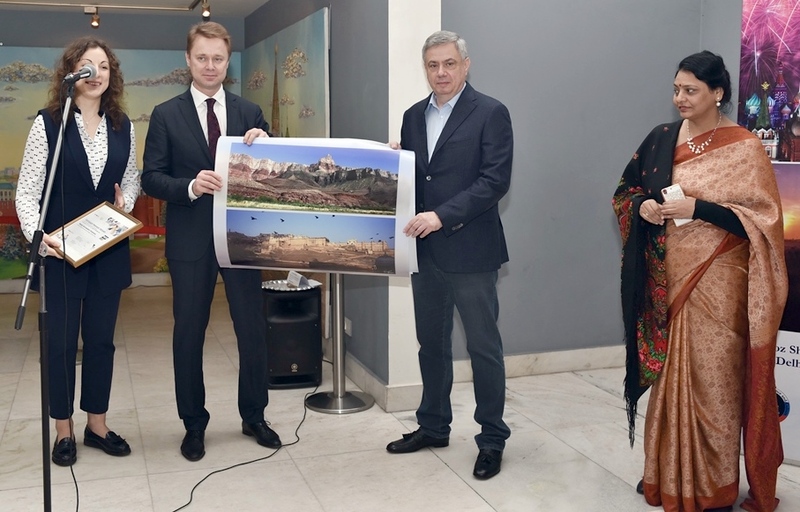 The winners of photo exhibition received certificates and souvenirs from the distinguished dignitaries. Photo BRICS is a unique project launched this year for youth BRICS Photographers. It has sought to facilitate international cultural dialogue between BRICS countries through photography and other visual aids. The project is organised by the Russian Union of Youth, National Committee for BRICS Research (Russia), ROSSOTRUDNICHESTO, International Forum (India), Forum of Indian Photographers & Artists (India), All-China Youth Federation (China), Generation Next Institute (South Africa), and PROLAB Photography Production Centre (Russia). The theme of 2016 Photo Contest is National Symbols of the BRICS, Architecture, Nature. Each country presented 10 best photos (48 works in total), capturing nature and architecture of the BRICS countries and symbolising one of the nations, its values and heritage. In total, 308 young participants from Brazil, India, Russia, China and South Africa had sent more than 1000 photos.